4K UHD TV interest causing an OLED rethink | What Hi-Fi? Korean press reports says Samsung is set to launch its first 55in OLED TV within the next couple of weeks, some six months behind rival LG. But sources close to the company suggest the new technology, once heralded as the immediate future of TVs thanks to its light weight, high quality and slim screens, may be on the back burner for now, as Samsung concentrates on 4K TV using existing LED-lit LCD displays, such as its flagship S9 model (above). Quoted in Korea's JoongAng Ibo newspaper, the source says that the company is less than worried by the much-delayed launch of OLED TVs, originally expected last year in time for the London 2012 Olympics. The technology missed that slot, and some industry commentators even speculated that Samsung wouldn't even launch OLED screens this year, due to the enormous problems in making the displays, and the impact of low production yields on the cost of the panels, and thus the profitability of TVs using them. Now it seems it's due to launch its first real commercial OLED TV within weeks; the super-thin 'next generation' LG OLED TV is already on sale – or at least taking pre-orders for delivery from next month. However, the Samsung source told the JoongAng Ibo 'We do not put a big significance on the timing of OLED TV release. It seems the success of UHD (or 4K) TVs, seen by many as a stopgap measure while manufacturers got to grips with OLED technology, has taken the big TV companies somewhat by surprise. Despite the initial comments of Samsung's consumer electronics boss Yoon Boo-keun, who dismissed rival LG's launch of an 84in UHD TV by saying that 4K 'has no value without content that meets the screen quality', the JoongAng Ibo's Samsung source says that the company's focus has shifted from OLED to UHD TVs for the time being. What's more, having rolled out UHD TV with demonstrations of 85in, 95in and 110in models at the CES 2013 show in Las Vegas in January, including its much-discussed 'easel'-style S9 models, Samsung has since canned the larger screens, and introduced 55in and 65in models, citing low demand for the really enormous screens. The company says its 85in model, despite carrying a price-tag of some £35,000, is proving hugely popular in China and the Middle East. Market analyst DisplaySearch, having initially predicted worldwide UHD TV sales of just 90,000 units this year, revised its estimate up by more than an order of magnitude to 930,000 units. GfK estimates UHD TVs could sell as many as 2.3m units worldwide this year. LG has suggested OLED TV will ship as many as 700,000 units in 2014, and grow to 3m units in 2015, accounting for around 1% of the TV market, but DisplaySearch has just reduced its earlier estimate of 1.8m OLED TV sales next year: it now says only 300,000 OLED sets will be sold worldwide in 2014. 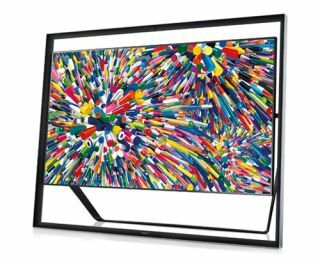 That brings it in line with another market analyst, iSuppli, which says it estimates just 1600 OLED TVs will be sold globally this year, and 200,000 next year. Lux Research is even more pessimistic, expecting OLED to shift just 7000 TVs next year, despite LG's KRW706bn (almost £440m) investment in a new plant to make the screens, said to have a capacity of almost two million 55in panels per year. DisplaySearch agrees with the problems of OLED production: it expects yields – currently around 10%, meaning nine out of ten panels produced get junked – will improve, but that OLED screens will still be much more expensive than their LED-lit LCD equivalents. It estimates the current manufacturing cost of a 55in OLED panel to be $2454 – around £1570, or almost 6x that of an LCD panel of the same size. While this may fall to just over S1500 (about £960) next year, as production yields improve, that will still be almost 5x the price of an LCD screen.